Until now, a Houston drone business had to make two flights for aerial thermal imaging projects like roof and equipment inspections – one with a thermal camera to detect an anomaly and then another with a standard-vision camera to confirm it. That’s why Professional Drone Services is proud to announce its investment in a new DJI Matrice 210 drone that allows us to carry two cameras simultaneously – as well as the best thermal- and standard-vision aerial cameras on the market – the DJI Zenmuse XT (powered by FLIR) and the DJI Zenmuse X5S! We’ve also updated to the most powerful, state-of-the-art zoom lens you can get – the Panasonic Lumix G X Vario 14-42mm power zoom lens. The new equipment, he explains, will not only give PDS the ability to offer a full range of thermal solutions and applications in just one flight, but protection against the harshest weather and the immediate downloading of data on site. This is possible with PDS’ new Crystal Sky Monitor, which allows for the transfer of files straight from a tablet to a hard drive on site. Here are the specifications for all our new components. Have a job that requires these technical capabilities? Get the ball rolling and contact us! 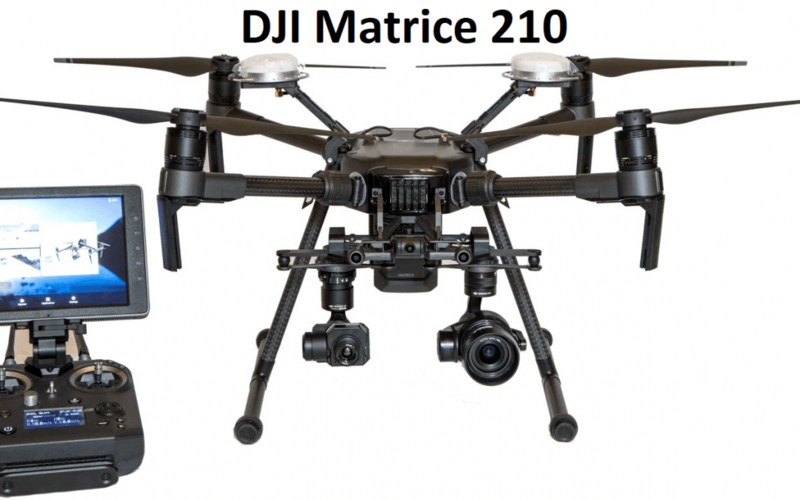 The DJI Matrice 210 drone. Offering ultimate adaptability on the go, this new, industrial-grade done sports DJI’s first-ever dual camera mount for simultaneous thermal- and standard-color imagery. That makes it invaluable for such commercial tasks as inspections, firefighting, land surveying, agriculture and search-and-rescue missions in hard-to-approach areas. Able to fly up to 35 minutes with an operation range of 4.4 miles, the Matrice 210 also features a weather-resistant design with dual battery bays that can even heat up batteries in frigid weather. So if you’re looking for strength and reliability in the worst conditions, you really can’t find a better solution than this! 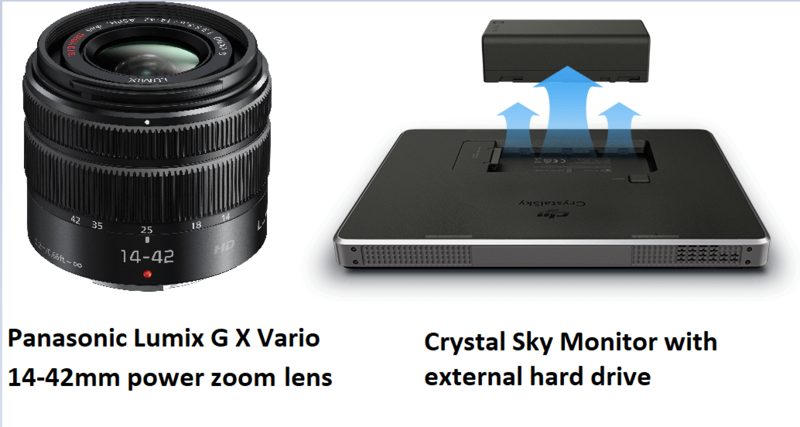 The Crystal Sky Monitor allows for the immediate viewing and downloading of data on site if desired by the client. The DJI ZenMuse XT thermal camera. If you want the best aerial thermal imaging in the world, you’ll only find it in this camera – guaranteed. Powered by FLIR – the world leader in the design and manufacture of thermal imaging cameras, The Zenmuse XT offers unrivaled expertise in gimbal technology and image transmission. Unlike most other thermal cameras, it’s able to give you pinpoint precision over very large areas, then saves them for analysis and reporting. In short, it’s the fastest, the best and the most reliable thermal camera you can buy. The DJI X5S aerial camera. Equipped with an uprated Micro 4/3 sensor, the Zenmuse X5S has a dynamic range of 12.8 stops with a much improved signal to noise ratio and color sensitivity than the X5R. It supports up to eight standard M4/3 lenses (including zoom lenses) with focal lengths ranging from 9mm-45mm(equivalent to 18mm-90mm on a 35mm camera), allowing more creative flexibility. The new CineCore 2.0 image processing system on the Inspire 2makes the Zenmuse X5S capable of capturing 5.2K 30fps CinemaDNG video and Apple ProRes video as well as 4K 60fps using H.264 and 4K 30fpsusing H.265 (both at 100Mbps). Continuous DNG burst shooting at 20fps with 20.8MP images is also supported. The Zenmuse X5S was designed to keep pace with the rigors of high-end professional aerial imaging.